Ellen Schwartz is the Treasurer of the of the Women's International League for Peace & Freedom. In 2003 Keith Wagner, Jason Rabinowitz, Stella Levy (an attorney), Rashad Baadqir and Ellen Schwartz (co-chair) were leaders of the Sacramento Coalition to Stop the Patriot Act. Rashad Baadqir, was also Executive Director for The Council of American-Islamic Relations. In 2009 Ellen Schwartz, Northern California , was elected to the National Co-ordinating Committee of the Committees of Correspondence for Democracy and and Socialism from the member's post National Convention ballot. Schwartz serves as a member of the Women's International League for Peace & Freedom National Board, as of March 18, 2010. In 2010, Jonathan Nack, Ellen Schwartz, and Steve Willett, served on the the Northern California Coordinating Committee of Committees of Correspondence for Democracy and and Socialism. 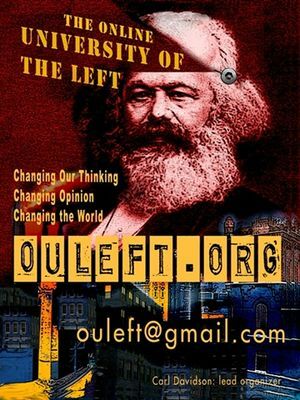 The Online University of the Left, a new `Left Unity’ project, was initiated by the Committees of Correspondence for Democracy and Socialism in 2012. It’s core orientation is Marxist, but it contains teaching resources reflecting the full range of views on the wider left. About 50 left academics are involved in the core group so far-Richard Wolff, David Schweickart, Rose Brewer, Timothy Johnson, Gregory Morales, Bill Tabb, Ellen Schwartz, Jerry Harris, Linda Alcoff, Dana Cloud, Gar Alperovitz, to name a few. One of the OUL’s key aims is to solve this problem of scattered resources, creating a web portal that will bring much of this valuable material together in one spot in cyberspace. Carl Davidson is lead organizer. In 2013 Ellen Schwartz, Northern California, served on the National Coordinating Committee of the Committees of Correspondence for Democracy and Socialism. This page was last modified on 28 January 2017, at 21:25.